(McLean, VA, August 23, 2011) – RESOLVE: The National Infertility Association is pleased to announce that Tertia Albertyn will be honored with the 2011 Hope Award for Best Book for So Close: Infertile and Addicted to Hope. Albertyn will accept her award at RESOLVE’s Night of Hope Gala on September 13, 2011 at Guastavino’s in New York City. As the organization that supports and provides voice for people diagnosed with infertility, RESOLVE established the Hope Awards to recognize professionals, companies, volunteers and the media who have demonstrated innovation and compassion to benefit people struggling with infertility. So Close: Infertile and Addicted to Hope is the honest, heart wrenching, exhilarating story of Albertyn's battle with infertility. The acerbically funny Albertyn takes you through her long, agonizing journey – including nine IVFs – to motherhood. Albertyn is a seasoned infertility veteran and now mother to three kids. Her popular blog (www.tertia.org) was rated the top blog in South Africa in 2007, 2008 and 2009. In the five years, nine IVFs and many losses it took to conceive her twins she has seen and done it all. 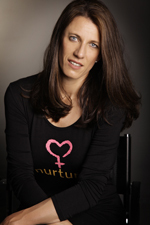 In 2007, she cofounded South Africa’s biggest infertility support portal (www.fertilicare.org) and in 2008 she launched Nurture, the country’s premier Egg Donor and Surrogacy program (www.nurture.co.za). She is a board member of the Society of Cross Border Reproductive Care, has a MBA from the University of Cape Town and lives in Cape Town, South Africa with her husband, the IVF twins and the surprise baby. The 14th Annual Night of Hope attracts more than 300 leaders and influencers in the family building community. Past Hope Award recipients include The TODAY Show, The View, Congressional Coalition on Adoption Institute and Church & Dwight, makers of First Response®. For press information in regard to covering the Night of Hope event, contact Andy Schwarz at aschwarz@resolve.org For more information on the Night of Hope, visit www.resolve.org/nightofhope. RESOLVE gratefully acknowledges the 2011 Night of Hope Big Apple sponsors: Attain Fertility, EMD Serono, Ferring Pharmaceuticals and Merck.